Bennetts Timber have recently supplied Paul Mooney Building Services of Preston, Lancashire with Western Red Cedar Cladding for use as external facing material for a bespoke garden room which can be seen on the photo. Garden rooms are becoming a popular addition for the increasing number of people who now work from home and need a warm spacious room from which to work, without the normal distraction of the home, utilising the garden offers an ideal solution. 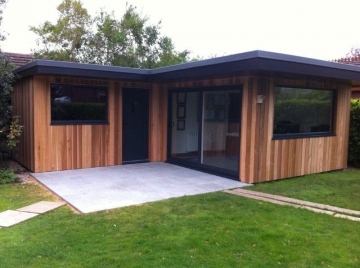 With the use of high specification thermal insulation the Garden Room can be used all year round and for a variety of uses including office, art studio, therapy room, music recording studio, home cinema and children's playroom so they are incredibly adaptable. Timber cladding offers one of the most versatile and luxurious finishes to the exterior of a Garden Room giving it a thoroughly contemporary feel. A number of different species of wood are suitable including Western Red Cedar, Siberian Larch and Thermowood - all of which can be supplied by Bennetts timber to your own specification, so do not hesitate to contact us for a quote.